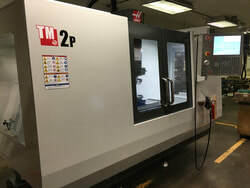 Our newest addition for fab services is a Haas TM2P machining station. The machine shop at Mr. Plastics includes four manual vertical Bridgeport type knee mills, and a Romi manual lathe. The latest addition is a state of the art Haas vertical CNC mill, suitable for smaller precision parts. It is capable of intricate 2D and 3D machining, engraving, as well as 4th axis operations that are not possible on manual machines. ​The CNC milling operations are programmed with Mastercam 2017, which can accept customer input in a variety of 2D and 3D CAD formats, including DXF, DWG, IGS, STP, and X_T. We use the Haas for production machining as well as for short runs and prototypes. Our skilled fabricators have a reputation for producing the highest quality fabricated products in Northern California. Their work can be seen in Museums, Corporate Offices and Medical Equipment around the world! Mr. Plastics' fabrication expertise covers a wide range of industrial and retail applicat﻿ions. Our fabricators are among the best in the industry, with expertise in exacting medical parts and other challenging projects. Call and speak with one of our experienced sales associates today.